Far from the accustomed sobe noodles, steamed rice, dried horse mackerel, and seaweed of his homeland the exotic food left Mr. Shichida bewildered and a bit ill. A food hangover, he stated. With the vast number of fast food chains and western cuisine making its way into Japan Mr. Shichida and the Japanese sake brewery industry are facing a shrinking market at home. Since the 1970’s the market for sake has been growing smaller and smaller both due to a shrinking birthrate and the switch of many Japanese drinkers to imported wines, beer, whiskey, and alternative Japanese spirits such as shochu. 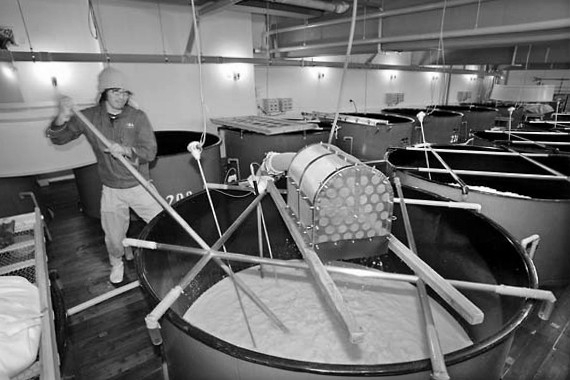 Sake is not particularly popular outside of Japan either with the vast majority of the sake exports to Japanese restaurants abroad, severely limiting the market value. McCaughley elaborates on several of the problems facing the industry today. The elderly Japanese men who are in charge of making decisions make them too slowly, even laboriously. This slow to adapt process is a death knell to the industry if it wishes to make use of the quick, impulsive, and immediate gratification nature of the West. “If you want to sell in the West, you’ve got to tap into that,” Mr. McCaughley said. With the rapidly changing market trends in the West constantly on the move and young people constantly looking for new drinks to try it will be very difficult for the shrinking Japanese brewer industry to maintain any standing for long. Sake is not just for those people who want to visit Japan. There is hope yet for the ancient Japanese beverage however. Most Westerners see sake as a drink to be savored alongside sushi and sashimi, but Mr. Shichida is looking to challenge that assumption. “Sake is surprisingly versatile. I’ve discovered it goes well with many Western recipes, perhaps even better than wine or beer,” Mr Shichida stated. Sake pairs quite well with many Western dishes. Fresh oysters are generally served with Champagne or Chablis, but Mr. Shichida suggests that sake works in sync better to bring out the oyster’s taste. The mellower sake helps remove the oyster’s briny taste while the sake’s umami, a savory sensation considered to the the “fifth taste”, helps improve the fleshiness of the oyster. Mr. Shichida also points to some sake’s that are not highly valued in Japan, but go well with certain Western dishes. In Japan highly polished sake that gives a flowery, smooth taste is highly prized. The brew 75 Unmai, a full bodied sake that uses unpolished rice, compliments meals of lamb with a round, woody flavor with a tempered acidity. The expansion in rarely used and undervalued sake will undoubtedly be a boon to breweries exporting to the West. This plays an interesting loop as the westernization of Japanese daily meals becomes more common. Brewers say they have one ultimate goal in expanding to Western markets: bringing sake back in Japan. “If we are able to tell the Japanese, ‘Look how much foreigners are enjoying sake,’ that would give them an opportunity to rediscover sake and revive demand,” Mr. Shichida said, “We don’t want our culture to disappear. We really don’t." Not only merely giving a domestic product a foreign appeal, but Mr. Shichida’s work to pair some of the more than eighty types of sake with Western foods has the potential to give domestic sales a boost even while Western foods crop up in Japan. The brewers are inadvertently giving their countrymen a reminder of who they are even in the midst of burgers and corned beef replacing more traditional Japanese meals at some level. Part of the difficulty in bringing it back home is in marketing the product, both domestically and abroad. Many Western breweries are beginning to push sake as the next fad in drinking, much like the craft beer explosion of recent days. Two European brewers have already started making sake on a commercial scale, Nogne O of Norway and Arran of Scotland. Many bars are already using sake to create new cocktails and reinvent old, familiar ones. Part of the market appeal is to make sake popular abroad is to change what it is compared to. In Japan many have switched to beer, which also is more common in the West, thus the breweries are considering making sake a companion to beer on the shelves. This is partially due to sake and craft beer sharing a similar brewing process, but also because it may help attract a younger crowd in search of new tastes. At home the idea of comparing sake to beer is anathema for some, like comparing Chardonnay to Pepsi. Mr. Shichida says he is used to rowing against the tide and has done so before. As a young man he was the first brewer in the area to export, fighting against traditional Japanese insular belief, and expanded to foreign markets.They made fun of him then, but now they praise his foresight, he recalls.